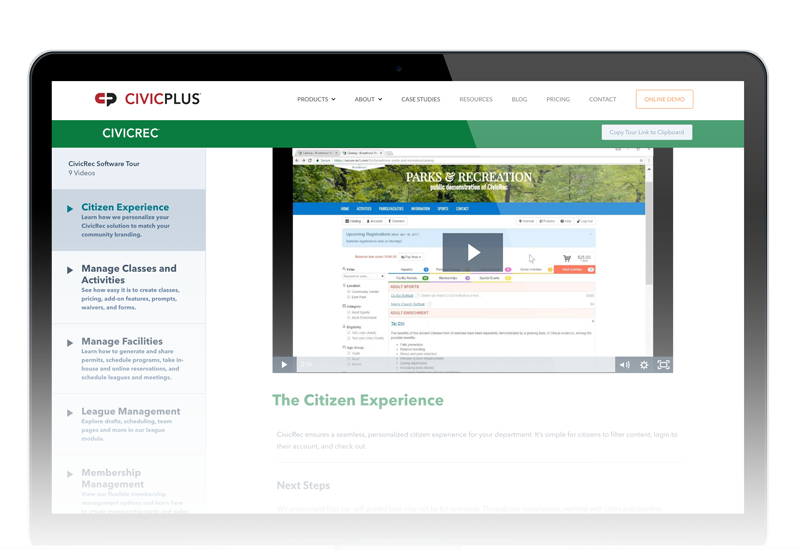 Citizen Experience - we personalize your CivicRec solution to match your community branding. Manage Classes and Activities - create classes, pricing, add-on features, prompts, waivers, and forms. Manage Facilities - generate and share permits, schedule programs, take in-house and online reservations, and schedule leagues and meetings. League Management - explore drafts, scheduling, team pages and more in our league module. Membership Management - flexible membership management options and learn how to create membership cards and order key tags. Manage Volunteers - create, manage, and organize volunteer opportunities for your citizens. Point-of-Sale - our unique module is ideal for merchandise, concessions, drop-ins, and more. Instructor Management - create instructor accounts, assign rates, configure participant data and issue contracts. Ticketing - create, sell and scan tickets for events in-house, online or from a mobile device.